I received word today that Douglass North passed away yesterday at the age of 95 (obit here). 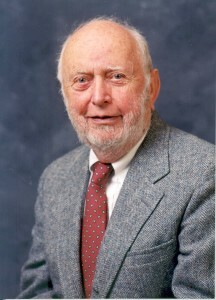 Professor North shared the Nobel Prize in Economic with Robert Fogel in 1993 for his work in economic history on the role of institutions in shaping economic development and performance. Doug was one of my first professors in graduate school at Washington University. Many of us in our first year crammed into Doug’s economic history class for fear that he might retire and we not get the chance to study under him. Little did we expect that he would continue teaching into his 80s. The text for our class was the pre-publication manuscript of his book, Institutions, Institutional Change and Economic Performance. Doug’s course offered an interesting juxtaposition to the traditional neoclassical microeconomics course for first-year PhD students. His work challenged the simplifying assumptions of the neoclassical system and shed a whole new light on understanding economic history, development and performance. I still remember that day in October 1993 when the department was abuzz with the announcement that Doug had received the Nobel Prize. It was affirming and inspiring. As I started work on my dissertation, I had hoped to incorporate a historical component on the early development of crude oil futures trading in the 1930s so I could get Doug involved on my committee. Unfortunately, there was not enough information still available to provide any analysis (there was one news reference to a new crude futures exchange, but nothing more–and the historical records of the NY Mercantile Exchange had been lost in a fire).and I had to focus solely on the deregulatory period of the late 1970s and early 1980s. I remember joking at one of our economic history workshops that I wasn’t sure if it counted as economic history since it happened during Doug’s lifetime. Doug was one of the founding conspirators for the International Society for New Institutional Economics (now the Society for Institutional & Organizational Economics) in 1997, along with Ronald Coase and Oliver Williamson. Although the three had strong differences of opinions concerning certain aspects of their respective theoretical approaches, they understood the generally complementary nature of their work and its importance not just for the economic profession, but for understanding how societies and organizations perform and evolve and the role institutions play in that process. The opportunity to work around these individuals, particularly with North and Coase, strongly shaped and influenced my understanding not only of economics, but of why a broader perspective of economics is so important for understanding the world around us. That experience profoundly affected my own research interests and my teaching of economics. Some of Doug’s papers continue to play an important role in courses I teach on economic policy. Students, especially international students, continue to be inspired by his explanation of the roles of institutions, how they affect markets and societies, and the forces that lead to institutional change. As we prepare to celebrate Thanksgiving in the States, Doug’s passing is a reminder of how much I have to be thankful for over my career. I’m grateful for having had the opportunity to know and to work with Doug. I’m grateful that we had an opportunity to bring him to Mizzou in 2003 for our CORI Seminar series, at which he spoke on Understanding the Process of Economic Change (the title of his next book at the time). And I’m especially thankful for the influence he had on my understanding of economics and that his ideas will continue to shape economic thinking and economic policy for years to come.